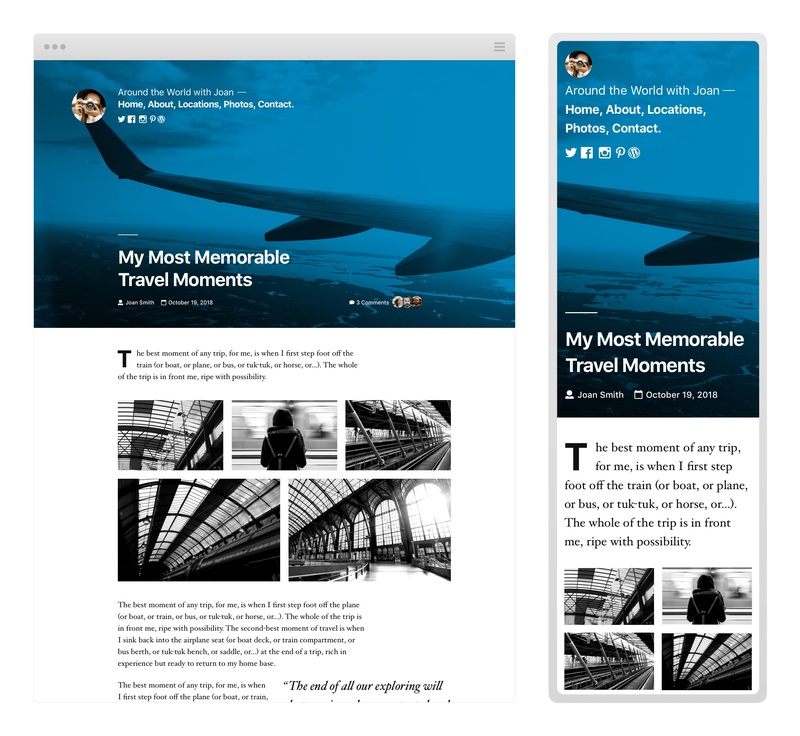 Gutenberg grants users an unprecedented level of freedom to customize their site’s layout and design. 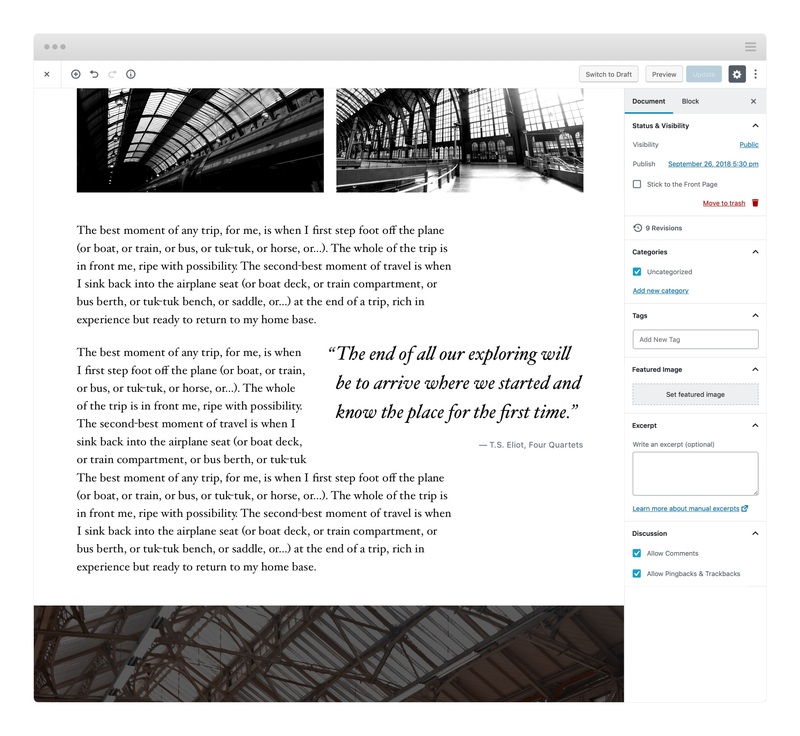 In order to fully achieve their vision, users will need a new generation of flexible themes, built to take advantage of the creative freedom that Gutenberg offers. 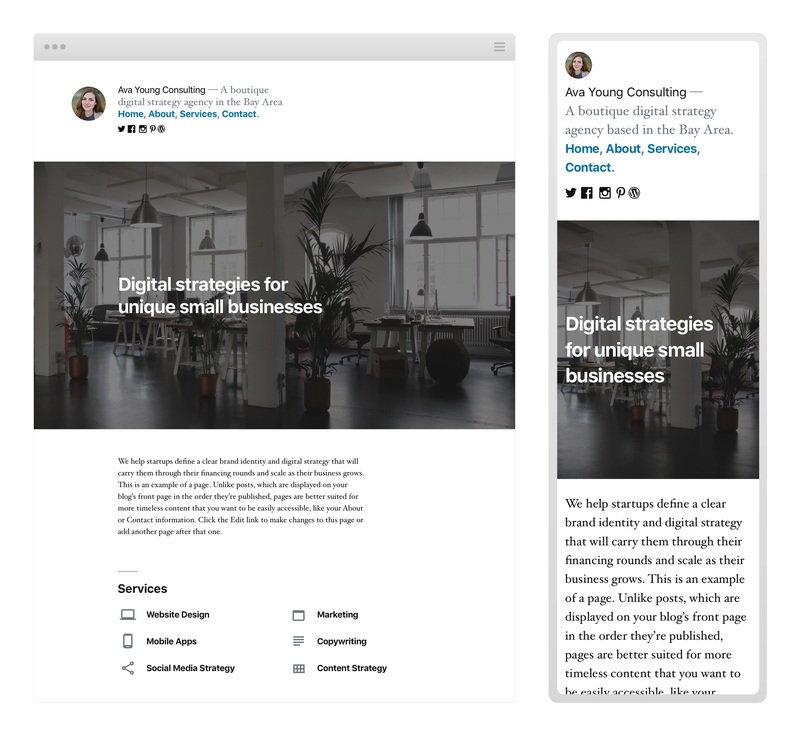 With that in mind, WordPress 5.0 will launch with a brand new default theme: Twenty Nineteen. The theme will be led by @allancole, supported by @kjellr as a design coach. As mentioned in the release plan, WordPress 5.0 will be released on November 19th, 2018, so this is a faster-than-usual theme build. The first release candidate is estimated for the end of October, so we’ll want to have a working version of the theme ready by then. Because of time limitations we may remove Twenty Nineteen from 5.0 if it is not ready in time for launch. If you are interested in contributing, please be sure to follow this blog. During the design and development process, there will be weekly half-hour meetings every Tuesday at 16:00 UTC in #core-themes, beginning today, October 16, 2018. Theme development will happen on GitHub and in the interest of time, an in-progress version of the theme code has been uploaded here: https://github.com/WordPress/twentynineteen. Once the theme is stable, it will be merged into core and the GitHub repo will be depreciated. The theme is based on both _s and the gutenberg-starter-theme. SASS is used in some key areas which has been helpful for keeping styles in-sync between the Gutenberg editor, and the front-end experience. This is not usual for a default theme and open to debate. There is plenty of work left to do too and issues will be created in the coming days to help guide the process. This post summarizes the dev chat meeting from September 21st (agenda, Slack archive). Schedule: As of this meeting, we are 4 weeks from the final chance to merge in major features. This includes Twenty Seventeen. Tickets: There are currently 182 tickets in the 4.7 milestone. This is 20 more than last week. In just 8 short weeks, this needs to be zero. For any tickets you’ve moved into the milestone, please make sure these are active tickets, with some kind of activity in the last 10 days. Multisite scrub this week. Accessibility standing scrub on Mondays at 17:00 UTC in the #accessibility channel. Other teams tend to devote time in their weekly meetings. Meeting tomorrow in #core-restapi at 21:00 UTC to go through open issues around non-trivial, conceptual issues in WordPress. REST API team will prepare summary of issues for component maintainers and/or lead devs to review, question, and help guide discussion towards consensus. Unexpected change to media title behavior in WP 4.6.1 (#37989) – The main issue here was resolved, but there seems to still be some odd behavior affecting words being chopped off filenames with international characters. Could use extra eyes from anyone (along with @sergey) more versed in i18n. Regression on the attachment titles that we generate on upload all became URL encoded instead of reading like a normal title. Media search doesn’t include file name (#22744) – Committed earlier this week. Please report any issues that come as a result. Week of 9/26: A new experience for themes in the customizer (37661, @celloexpressions). Please review soon for any requested changes in direction or design. Summary: The existing themes section in the customizer is replaced with a full-screen theme browser and installer… The UI is nearly identical to wp-admin/theme-install.php… The .org-based theme-install previewer is not accessible here because it is likely to cause confusion with its customizer-like interface and the resulting need to switch contexts back and forth… An overarching goal is to avoid switching in and out of the admin/frontend/customize contexts during theme installation and previewing, instead staying in the hybrid customizer context that provides a combination of frontend plus controls… On the technical side, this heavily leverages JS-templated customizer controls and scales nicely to hundreds of themes. Please comment on the ticket with your feedback as soon as possible, preferably with specific concerns/ideas and reasons. Week of 10/3: Code-editing gateways, via CSS (35395, @johnregan3/@celloexpressions). Awaiting approval/feedback on the acceptability/ability to bundle the two proposed libraries in core, with feedback particularly needed from committers and anyone familiar with the Jetpack fork of CSSTidy. No updates, but would love to figure out a way to get more user feedback that helps us set direction for the editor. Will look to add some Core questions to annual survey on WordPress.org. Otherwise will start with something in the beta tester plugin, biased audience but it’s one that exists, is more likely to opt-in, and will be more flexible. @pbearne on Add filters to wp_new_user_notification and wp_password_change_notification (#38068) – added a set of filters to allow us to override email messages send by the wp_new_user_notification and wp_password_change_notification functions. @johnbillion to review as it relates to work on notifications.